The project’s location is quite unique. It is a rural place on the shore of a bay within the Bergen municipality. It is also within close proximity to Lagunen center and its shops, cinema, public offices, schools, the city railway, etc. All of these features are within a short walking distance. In spite of its rural setting, the residential building expresses a clear identity through fine architecture. 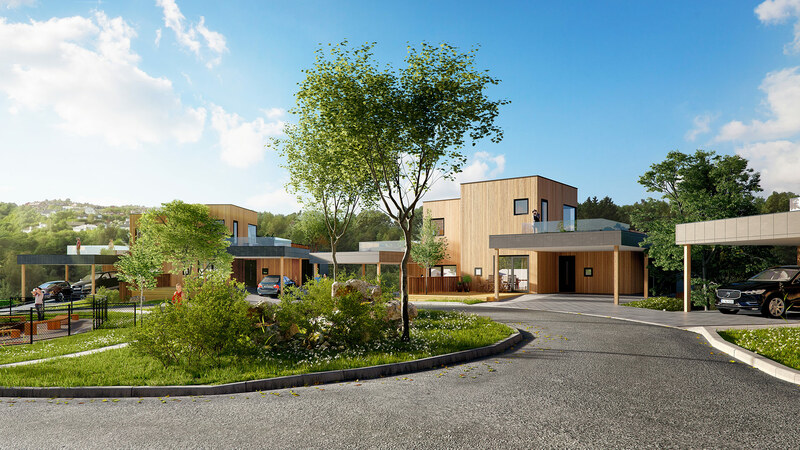 The homes are designed as 3 storey family homes. They offer unique space experiences with large through-living rooms. Individual adaptations are highly possible. In each home, there are large windows and terraces. These are adapted to the house’s orientation with optimal sunlight and views. These sun and view conditions are highly favorable in most of the homes. The first floor consists of a bedroom, bathroom, and a laundry room. The loft suite is a luxury. It has a living room and a roof terrace, for fun outside and inside. For special needs, there are alternative floor plans for the ground and the attic floors. The client needed top quality materials for marketing purposes. Simultaneously, he needed the materials to procure a building permit. Our renders needed to hone maximum precision for him to get the permit without problems from the City Design Commission. These two goals had the same time frame. The project encountered problems early in the process. 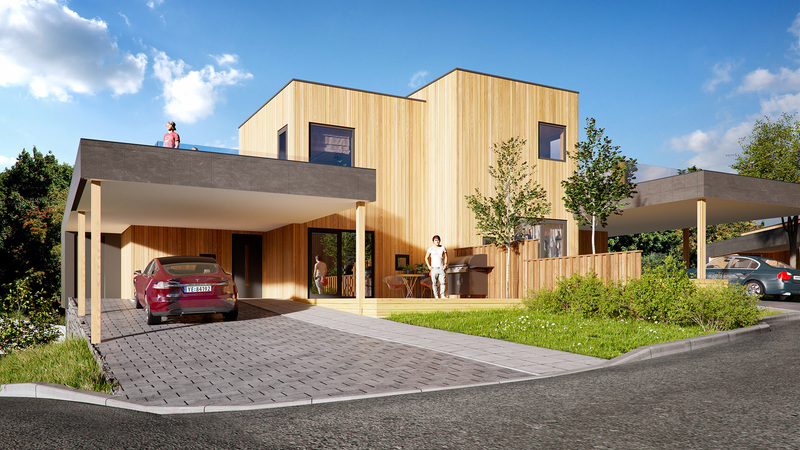 In the beginning, our client quoted several renders both exterior and interior. He believed that all 5 houses would be identical in a half circle layout. Our company did not provide ballpark quotes in the beginning. This was because doing so could lead to bigger problems later on. It isn’t obvious from the outset, yet a 3D studio must take into account the fact that clients are typically real estate developers and not architects. Sometimes the discrepancies in these two professionals leads to technical errors. What the real estate developer may think is correct, could actually be completely wrong by architectural metrics. Set the correct client expectations for the budget and the final result. 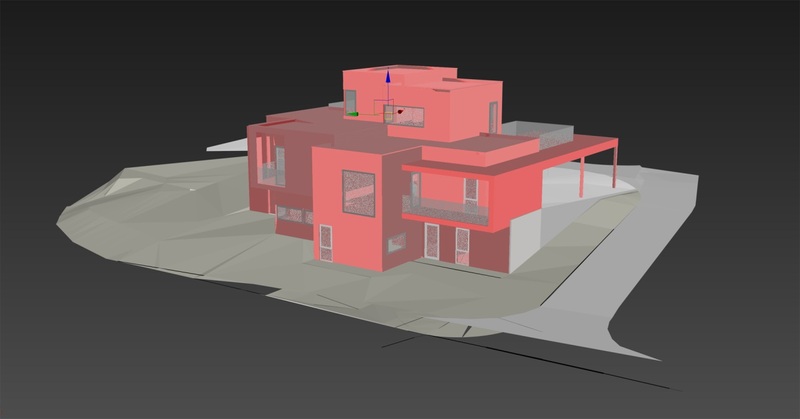 Such expectations will allow our client to determine the correct ROI of future 3D projects. Convey to the client the exact materials that are needed. Before the Roadmapping session, this client was assured he had the correct materials, even ready 3D models. Closer looks revealed a vast margin of error in this analysis. At the beginning of the discussion, the client told us that the 5 houses would be totally the same. After a thorough check of the architectural blueprints, we discovered some variations in each of the 5 houses. 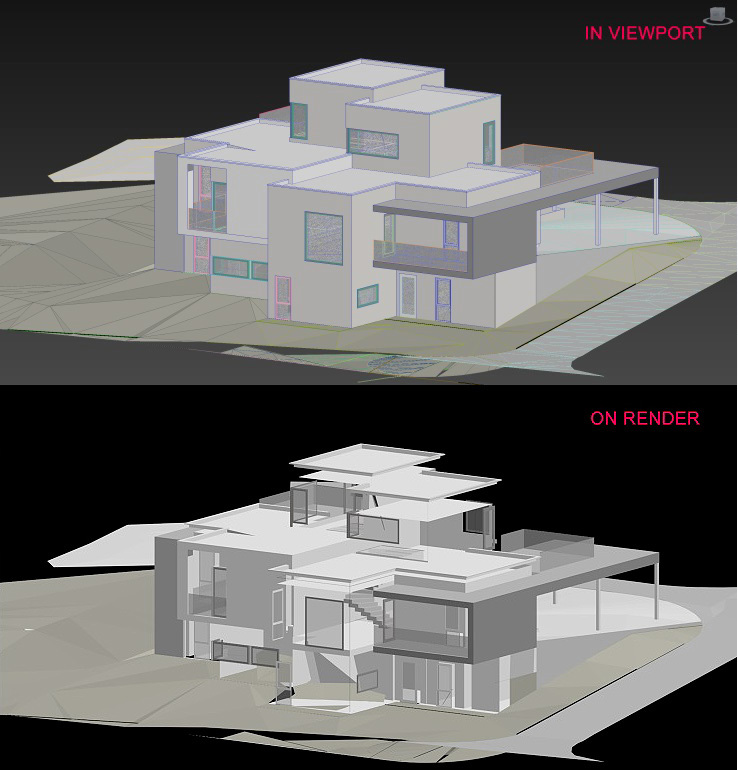 The difference isn’t by a large margin, but the client needed these renders to acquire a building permit. This required the 3D visuals to be laser precise. Even the smallest variation could be considered a “mistake” and could prolong the modeling stage by 5 times. This would also delay the building permit. Another high priority problem were the 3D models themselves. Our client reasoned that if he had 3D models ready in advance, this would lower the price of 3D visualization. What we had found after checking 3D models done by architects is that these advance made models could not serve the intended purpose. Below are some technical facts to refresh each architect. You need to implement these facts before giving your work to a 3D artist, for optimal results. With two normals, there will always be one on each side of the surface. They will point in opposite directions. The choice of the side from which the normal projects define the front or “face”of a polygon. It is usual for polygons in 3D computer graphics to have only one side. Which means they only have one normal, unlike with their physical world counterparts. This is because polygons are typically designed to create a closed mesh which represents the 3D object surface. The polygon backside is hidden inside the object. 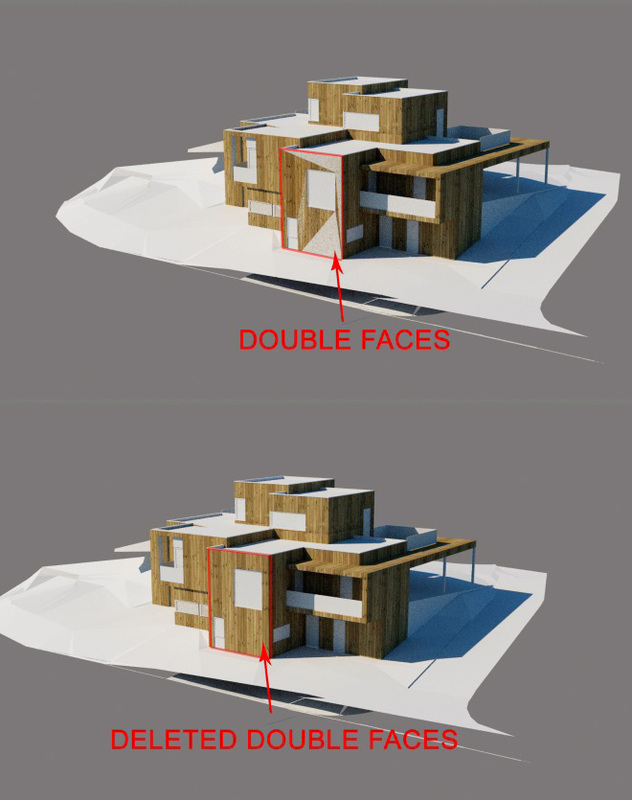 To save render time, polygons are kept single-sided and the normal projects expose only the object face. It’s impossible to use a 3D model with flipped normals. When you render such an image, dark areas from the above image will not be rendered. 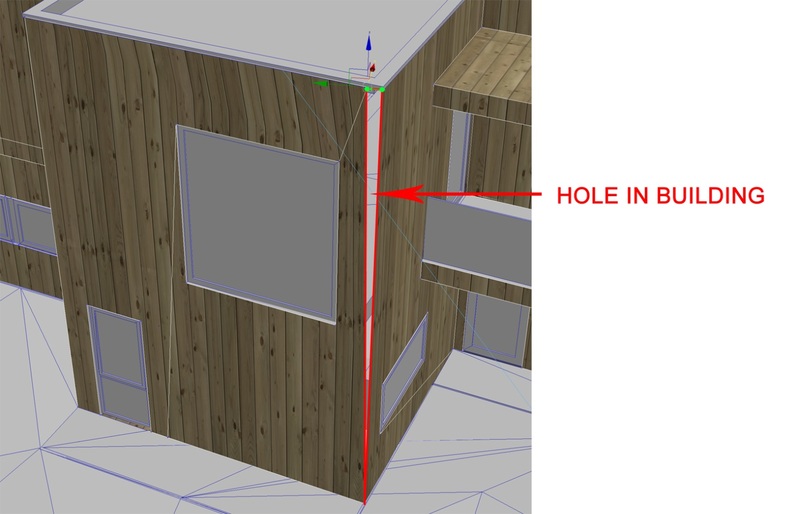 Your house will have huge holes appear in the rendered image. 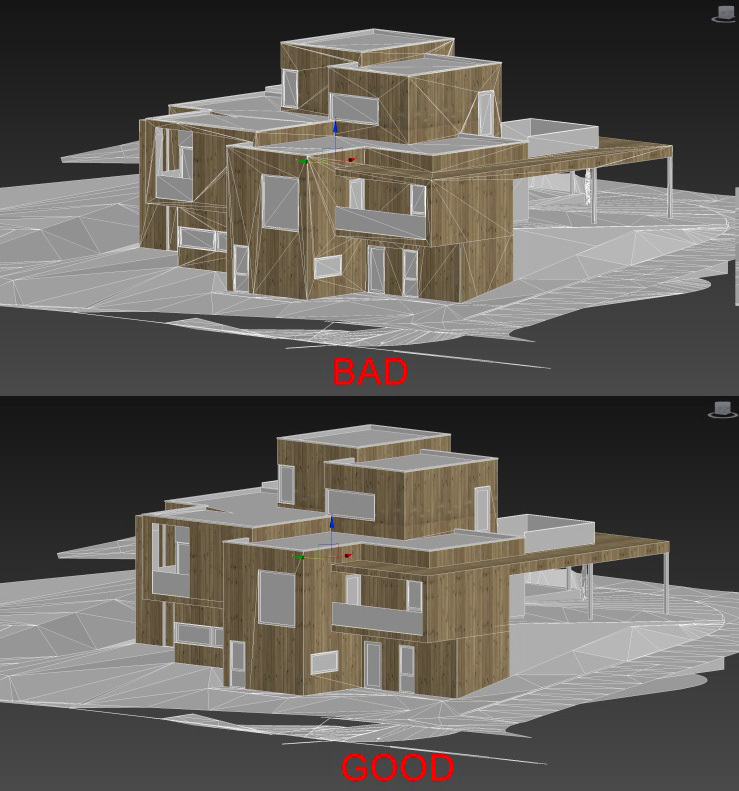 This is why the 3D artist must remodel these parts of the building from scratch. Consider a polygon from the above example. 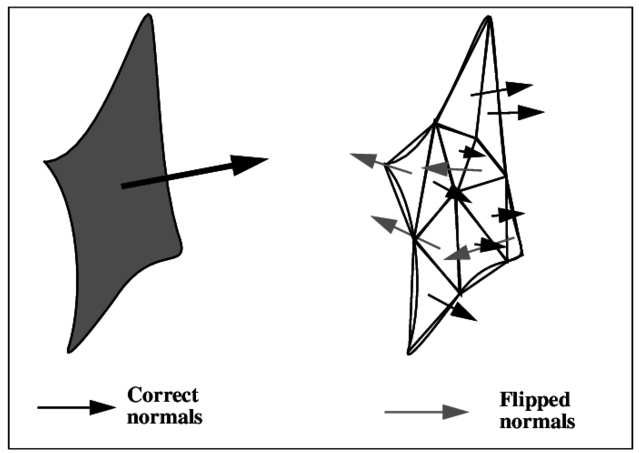 Even if such polygons have the correct normals, and we could fix the following problem, there are still two polygons located on the same coordinates. It’s not completely clear why this happened. It could be due to the fact that architects and 3D artists work in different programs. Common file types, which can still be opened by each party, are not completely supported across the two programs. Some features will be missing from each party’s system. The result is such that two polygons will use the same coordinates and other strange glitches. If we continue this way, such a problem can happen during the rendering process. This creates all sorts of unwanted surprises. Like half of the surfaces have textures, and the other half lacking them. Every time we get models from architects we get unwelded vertices. 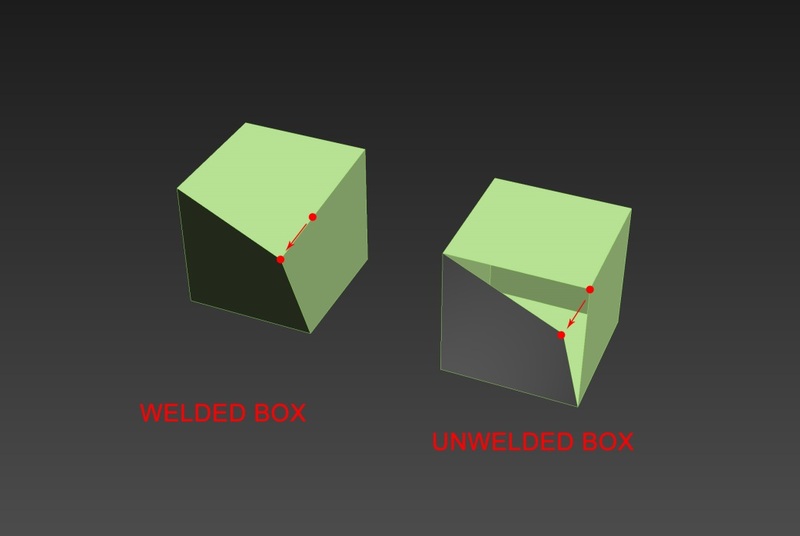 Most of the time, unwelded vertices are problematic unless welded. If you want to deform the model in some way or modify the topology, you may run into problems. You’ll likely have to push and pull the individual vertices. You may even have to manipulate them collectively to achieve your desired shape. If you don’t give the vertices welded, you’ll notice that they start to separate polygons from each other. This will leave empty spaces between them. Here is how it works on a model that architects sent. Moving one of the vertices on a building wall has created a hole in it. The quality is now bad. The more edges that you have the heavier the file will be. This results in slower renders. It’s harder to work with objects. More problems like artifacts and unwanted wall shadows crop up. The problem solution, in this case, is remodeling this building from scratch. You can see it from these above examples. 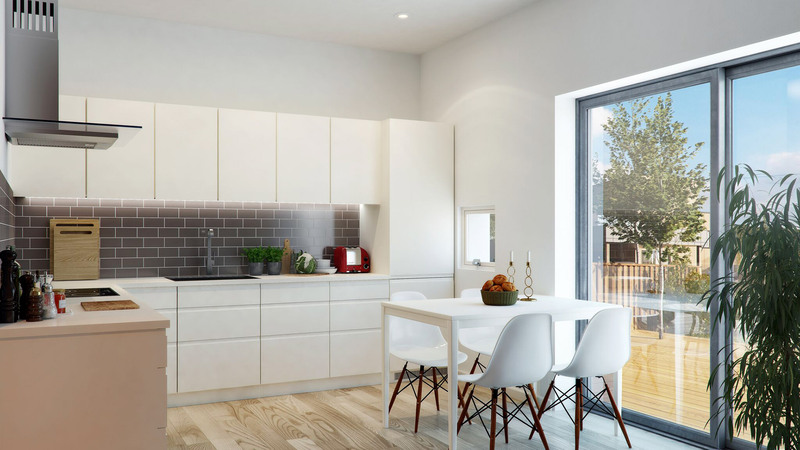 Even if a client comes to the table with 3D models, the 3D artists will need to remodel everything from scratch to have something to work with. He didn’t need to produce 3D models as he previously thought. 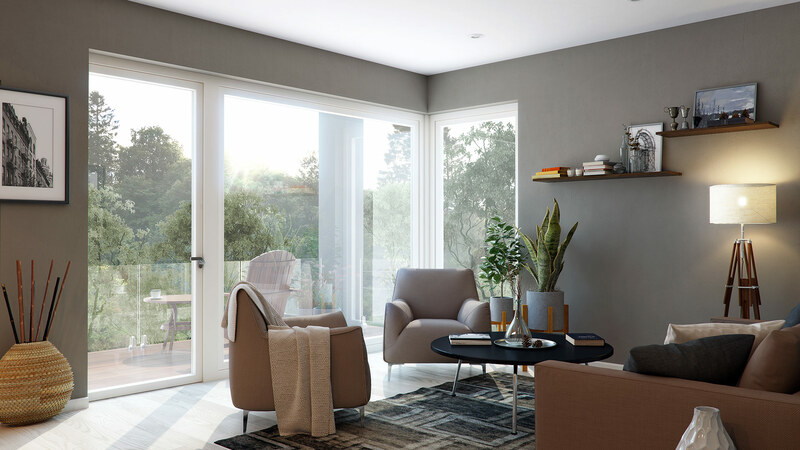 Most studios do nothing after turning in the final deliverable on a 3D visualization project. We strive to be different. A couple of months post project completion, we connected with our Solbo client. We sought his opinions on how the marketing campaign went. Our goal was to learn if something didn’t work. What was the cause? Is there something in the renders that was missing? Could we have led to better results for our part? In the Solbo case, there was nothing left to be done. A tried and true method yielded the best final outcomes. 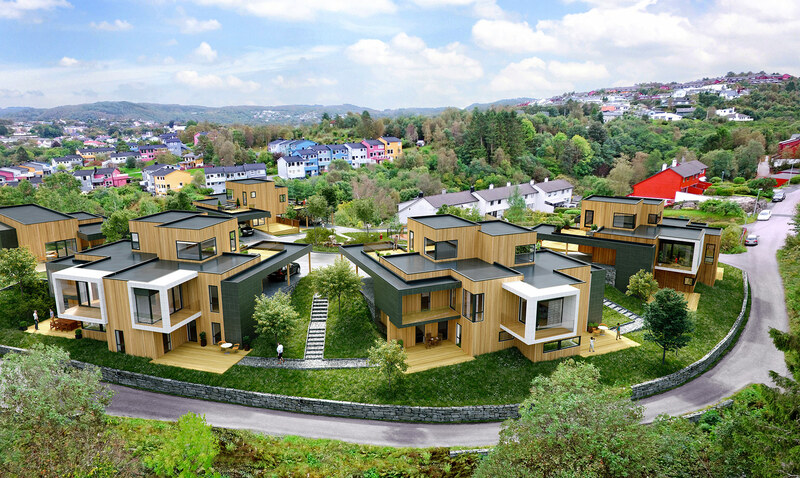 Next to all the houses of the project had sold by the time we made our follow-up. Our client was floored by his results. We opened the door for a long term relationship with him. We hope to do the same with all our future clients. Contact Us To Discuss Your Vision and Needs.